Fast freeride, freerace or blasting boards – call them what you will, the idea is to go as fast as possible, as easily as possible, no matter what the sea state. It is all about gaining maximum straight-line return for minimal rider input, flattering the rider and leave them buzzing from their session. Freerace was the natural progression when the freeride phenomenon took hold, bridging the gap between the passive freeride (read a propensity for ‘dullness’ in the eyes of experienced riders) and the downright terrifying in a slalom board. This test was originally published in the March 2019 issue. Over the past few years there has been a clear movement within the industry to redefine the middle ground. No longer would a dumbed down slalom board suffice; nor would an over-performing freeride. The class has deserved a new, unique description to set it aside from the two on either flank. Not altogether surprisingly, the answer for a couple of brands came in the compact design concept. 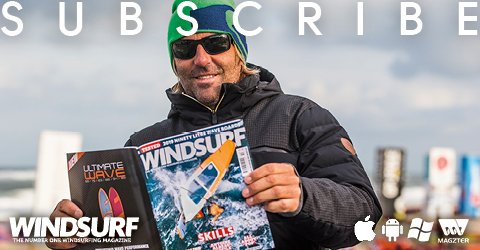 Fanatic’s Sebastian Wenzel has had great success with this pathway in both the Stubby and FreeWave STB, so it was only going to be a matter of time before the concept entered the ‘straight-line’ sector. With the realization that a short, narrow, parallel-railed outline has definite benefits, both in terms of ease of performance and cornering potential, it was soon clear that a new definition was due. JP and Werner Gnigler have followed suit with the Super Ride, whilst other brands have adopted similar elements in development, without going the whole hog. For example, Starboard have gone shorter with the Futura whilst keeping the outline wide, but have significantly exaggerated the vee in the hull to cushion and ease the ride. Severne have done similar, reconstituting what should actually be perceived as ‘pronounced’ vee. In doing so, both have brought their own ideas to the party, highlighting that a blasting board should be more comfortable to use in real-world coastal conditions, over a long period of time. The go-to contender for master blasting! To give you an example, many of us will have heard of (perhaps even participated in) quite a few downwind voyages and adventures over the years. Be it from K-Bay to Sandbanks at the start of Poole’s famous Windfest events, (when Olympian Nick Dempsey received newfound respect from his peers by destroying a fleet of notable professionals); Guy Cribb organising a Bournemouth-to-Brighton dash or a 500 km downwinder in Brazil … the freedom our sport provides for a bit of coastal adventure has been well explored and documented over the years. 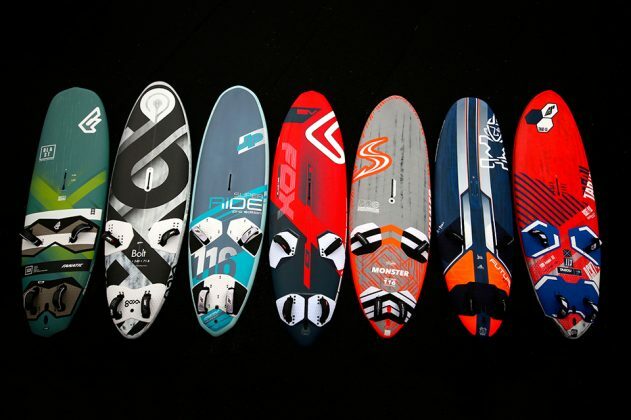 And we can tell you now: we would choose any of these blasting contenders over and above a fully fledged slalom board any day of the week! For what they give away in outright straight-line performance, they more than make up for in comfort, ease, practicality through the turn and playfulness. They represent ‘real world’ blasting and require far less commitment from the rider, enabling you to conserve energy and last far longer in a session. The other design movement that can’t be ignored is foiling. Whether you’ve tried it and been bitten by the airborne bug or not, a blasting / performance freeride platform is surely the primary contender for providing crossover potential. Every board here bar the Severne and Simmer have designated foil-ready boxes in them to house a foil, and yet we’d like to insert a very important caveat here. Just because a board is designated foil-ready doesn’t necessarily mean that it will offer a wonderful foiling experience! In windfoiling, setup is key, and simply reinforcing the Deep Tuttle box in a board doesn’t bestow it with the credentials to foil comfortably with any type of foil. The position of the fin box in relation to mast track and footstrap positions; the width of the tail … even the dome of the deck can have a significant impact on foiling comfort. To this end, we believe we are going to see more and more true hybrid boards enter the market in the coming seasons – boards designed with emphasis on both fin and foil sailing in equal measure; boards that perform beautifully with a variety of foils in, from low to high aspect, and yet feel no less capable by replacing foil with fin. We already have a good example of this in the Tabou Rocket Plus 113 and have to say if this is the shape of things to come in the near future, we’re incredibly excited. The first thing to note here is that all these boards will perform supremely in the right conditions and with the right pilot. And whilst most of them come supplied with a fin as standard, each board’s performance can be pushed further still by partnering it with a high performance fin … or even a couple of fins. The one board not supplied as standard with a fin is the Simmer Monster – a nigh on slalom performer that stole the limelight in light to comfortably powered conditions and benefited most from a precise, expensive blade plugged in. The Goya Bolt was also most at home in marginal to powered winds, with a crisp and familiar freerace nature underfoot. At £1675.00 it represents great value for a carbon-decked board in this test group. For just £24.00 more the Limited version of Fanatic’s Blast is also excellent value for a board that continues to challenge conventional thinking of the performance-versus-ease conundrum. It requires so little technical input from the rider, yet is fast in a straight line and just so easy round the corners, as if pre-programmed. The JP Super Ride continues in the same vain, being fast and controllable whatever the sea state, and just so much fun in the carve… yet does demand a little more input from the pilot to really understand its potential. No bad thing for those that like to be involved rather than just a passenger. That brings us onto the Starboard Futura and Severne Fox – two boards that are party to massive vees in their hulls. Both are somewhat conventional in outline and yet make a clear break from the ‘detuned slalom’ path. Both are fast, exciting … and above all comfortable to use, whatever the water state. The last board on test here is the new Rocket Plus from Tabou; a board that, on the face of it, is simply a subtle tweak of its predecessor. It comes to life and hovers on its fin, similar to the Rocket Wide, when delivering power … and yet the footstrap plug positions, width in its tail around the back foot and deck shape make it a stunning foiling board as well. So when it was widely accepted just a year or so ago that you’d require a board of at least 80 cm wide to foil comfortably … here is a foil-ready 73 cm wide board capable of foiling beautifully. For better or worse, you’ve got to love the speed of progression we constantly witness in our sport.